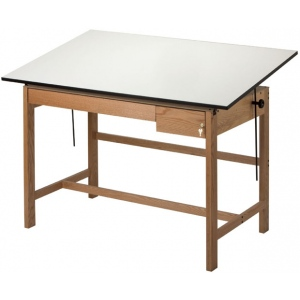 Attractive functional and durable these 4-post drafting tables are designed for larger top sizes and constructed from the finest quality solid red oak using through-bolt hardware to ensure a lifetime of use. * The natural oak finish is well protected by two coats of clear lacquer while the warp-free tabletops have long-lasting white Melamine laminate. * Tilt mechanism enables user to easily adjust the top angle from horizontal (0°) to 45°. * Includes 23"l x 31"w x 1½" reference drawer and 23"l x 8"w x 3½" tool drawer with smooth roller bearing slides and keyed lock. The height is 37 1/2".